A growing body of objective evidence suggests that neonicotinoid pesticides have a harmful effect on pollinators. We should be very concerned that that the Government will now be allowing neonicotinoid manufacturers to carry out studies on the safety of their own products. Neonicotinoid pesticides have a harmful impact on valuable insect pollinators such as bees. So should we be concerned that the Government is addressing these “shortcomings” in evidence by seeking research funding from neonicotinoid manufacturers? Clearly, there are conflicts of interest arising from allowing manufacturers to carry out studies on the safety of their own highly profitable products. Of more concern, however, is the potential for this to undermine the public perception of neutrality and independence necessary for confidence in the findings and any decisions taken as a result. The House of Commons Environmental Audit Committee’s (EAC) report on the draft National Pollinator Strategy talks of “a lack of universally accepted research [that] has allowed a degree of uninformed assertion to mix unhelpfully with robust science.” Whether industry-funded studies will be capable of generating “universally accepted” findings is a question that remains to be answered. The ban on neonicotinoids will be reviewed in 2015. The Government has stated that it is considering “further evidence needed to inform the 2015 review of the restrictions and future decision-making.” The Government’s opposition to the ban and support for industry-funded research, which will contribute to the review, casts serious doubts on the impartiality of the evidence the UK will be submitting and no doubt basing its position upon. With industry-funded studies an apparent certainty, the question now is whether Defra is willing and able to act as an independent “referee” (Defra’s term) to ensure the studies are free from commercial interest, and prioritise the health of pollinators over economic and political considerations. This too has been thrown into question by the Government’s public opposition to the ban and somewhat idiosyncratic interpretation of the precautionary principle – an approach designed to limit the potentially harmful impacts of certain activities (such as the use of pesticides) where scientific consensus regarding their safety does not exist. 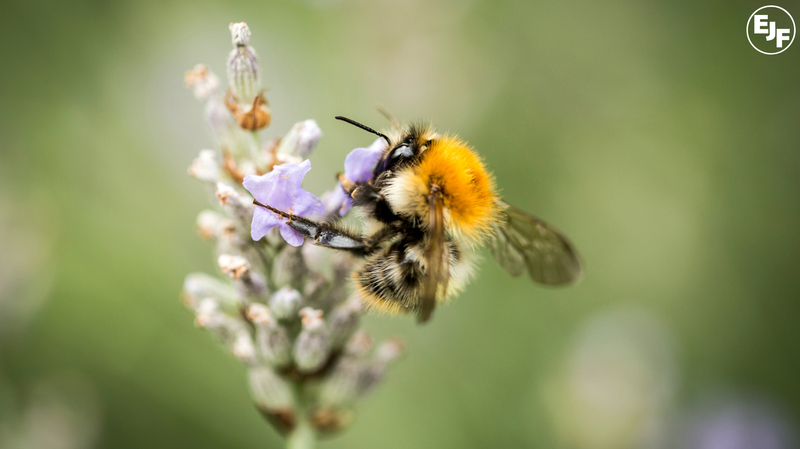 With a growing body of evidence suggesting a harmful impact on the UK’s vital and valuable insect pollinators, neonicotinoid pesticides represent an ideal case for the application of the precautionary principle. Considered against the potential economic, social and environmental consequences of further declines or even the loss of pollinators, the need to exercise precaution becomes even more compelling. However, the Government has taken the view that the risk to pollinators posed by neonicotinoid pesticides is “remote” and that a neonicotinoid ban would “cripple the economy”. By invoking economic considerations in the application of the precautionary principle and refusing to accept evidence contradicting its stated position of limited risk, the Government raises serious doubts over its ability to act as an independent “referee” for an issue on which it already seems to have made up its mind. In agreement with EAC’s findings, EJF believes the Government can and should put an end to the uncertainty over the threats posed by neonicotinoids to our pollinators; by accepting the European risk assessments, publicly supporting the ban, committing to uphold it and monitor its effects and not using the 2015 review as an attempt to end the ban or to otherwise circumvent it.